This homemade Peanut Butter Pie is made from scratch with just a few ingredients and will have everyone coming back for seconds! It’s CRAZY good! With step-by-step video. Taste: Like a massive peanut butter cup from heaven. Texture: The crust is crunchy yet buttery, the filling is ultra light, fluffy, and luscious, and the candy on top takes it to a whole other level. Every bite is bliss. Ease: Super duper easy!! You’ll get a few dishes dirty and need some patience for the pie to set but this is a great easy go-to dessert recipe. Appearance: It’s everything a girl could want in a pie! Pros: Easy, crowd-pleasing, and can be made ahead of time. Would I make this again? 100% yes. To me, peanut butter is one of the great pleasures of life. I’m OBSESSED with the stuff. Especially when it’s combined with chocolate… in PIE form. Life doesn’t get much better than a Peanut Butter Pie. *This recipe was originally published 3/18/15 and has been updated with new tips & photos. This isn’t any old peanut butter pie. I mean, just look at it. It’s over the top, messy, and unapologetically sinful in the best possible way. I’ve accompanied this recipe with a step-by-step video to not only show you how to make this beautiful pie, but to whet your appetite for it. The best part about this pie is that it is a total crowd pleaser and won’t last long at all. That coupled with the fact that it can be made completely ahead of time makes it a perfect go-to recipe for easy entertaining. Jared and I loved this pie, he even went back for seconds which he rarely does with dessert. It’s that good! I hope you make this pie soon and if you do, be sure to tag me on Instagram with the hashtag #handletheheat so I can see! In the bowl of a food processor process the crackers and sugar until finely ground. Add the butter and pulse until moistened. Use the bottom of a measuring cup, glass, or ramekin to press the crust mixture into the bottom and up the sides of a 9-inch pie plate. Bake until fragrant, about 12 minutes. Cool completely on a wire rack. In a large bowl, use an electric mixer to beat the cream cheese, 3/4 cup powdered sugar, and the peanut butter until light and fluffy, about 3 minutes. In a separate bowl, use an electric mixer with the whisk attachment to whip the heavy cream until thick and light. Add in the remaining 2 tablespoons powdered sugar and the vanilla extract and continue to whip until stiff peaks form. Gently fold the whipped cream into the peanut butter mixture. Pour into the prepared pie shell and freeze for 3 hours. Drizzle with melted peanut butter and melted chocolate. Top with mini Reese’s cups and peanut butter chips. Serve frozen or refrigerated. Store in the fridge or freezer, covered, for up to 3 days. 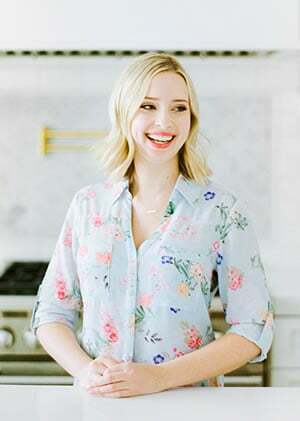 Tessa is a professionally trained chef, cookbook author, and cookie queen. She loves to write about all things sweet, carb-y, and homemade. She's on a mission to make the world a more unapologetically DELICIOUS place. Tessa lives in Phoenix, Arizona. Totally irresistible Tessa! I mean I just may have to come over for a bite right away! I made my son a chocolate peanut butter cup ice cream cake for his birthday last year and I’ve been dreaming of it ever since. This takes me right back to those memories. HEAVENLY pie recipe – sensational! And best of luck to you on the upcoming move! This pie looks so good I want to cry. I just moved to another country so this is the best excuse to buy a new pie mold for the kitchen. Can’t wait to give it a try. Thank you! Now that is my kind of peanut butter pie! The filling is pretty much the same as the one I make but that topping! Count me in on all peanut butter desserts! I am with you, Tessa, in the peanut butter fan club! Not only does this pie look luscious just as it is, but I can easily make this gluten free (when needed) by subbing gluten free grahams or the chocolate cookie outsides from Trader Joe’s gluten free chocolate sandwich cookies! ugh, oh my gosh; it looks amazing!! I loved the video! Peanut butter and chocolate is my downfall. I could eat it for breakfast, lunch, and dinner if it wouldn’t cause me to gain about 40 pounds overnight. This pie is such a treat. It’s presentation alone is enough to win over any chocolate and peanut butter fan! My favorite restaurant stopped serving peanut butter pie. Today I decided I had suffered without it long enough and found this recipe on Pinterest. WOW. It was easy to make. It hasn’t chilled enough yet, but I have the patience of a 3 year old. It’s absolutely divine already. Thank you! Where is the recipe!?? I see a video and your story but am desperately searching for the actual recipe lol.. Help! I don’t have a good stand mixer for making whipped cream (I don’t have a great hand mixer for that matter!). Could Cool Whip be subbed for the fresh cream? Must it sit for 3 days? Would you suggest serving this frozen or reridgerate? It’s for pi/pie day tomorrow at my hubby’s work. I’m wondering if he should keep it in the fridge or freezer for a couple hours before its served. Hi Katie! Please refer to the recipe, “Serve frozen or refrigerated. Store in the fridge or freezer, covered, for up to 3 days.” So yes, keep it refrigerated or frozen until ready to serve. I may be misunderstanding…do you have to let the pie sit for 3 days before serving? Or does it only last 3 days? I’m confused. It can be stored for up to 3 days. You definitely don’t have to let it sit for 3 days before serving! Hi! I am making this for a crowed – I was wondering if I could make it in a 9×13 pan or if you think the recipe would need to be tweaked at all? I made this today and it is delicious! I used a normal pie crust because I like them better than graham cracker crusts. I also added a layer of chocolate ganache to the bottom and drizzled some on top. I used about a cup of chocolate chips, stole three tablespoons from the heavy whipping cream for the filling, and added in 2-3 tablespoons of coffee. Again, very good pie! I will make this again. Wonderful, Lindsey! Glad you were able to make the recipe your own. This came out absolutely fantastic! Best peanut butter pie recipe ever! I made this for a family event and it was amazing. Everyone loved it. I used Trader Joe’s dark chocolate peanut butter cups and homemade peanut butter and it was amazing…very rich and not at all too sweet, like other versions I have tried. Thank you for this recipe! I bought Oreo CRUMBS instead of whole crackers … What measurement of crumbs would you say 14 crackers is equal to??? Did you freeze for 4 hours before you added the toppings? I am confused on that part of the directions . Thanks! Can the crust be done without a food processor? It always amazes me the question people ask you. READ people …It’s all right there in front of you. Do you ever tire of the idiots? Seriously this pie is awesome!!!! I think my boyfriend keeps me around just to make it for him! It’s always a huge hit. Love it! Hi! Can this just be refrigerated, instead of frozen, to set or is freezing a must? We have ZERO freezer space. You can refrigerate but I would do it for at least 6 hours to guarantee it’s firmed up! So happy to hear that!! How do I get your Made Ahead Baking Guide? I’m not usually the most creative, but the last few years I’ve made every peanut butter pie using Oreo peanut butter cookies. Delish! This looks fabulous, can’t wait to try it. Congratulations on 9 years! We also were high school sweethearts. This May we will be married 40 (holy cow!) years. Happy anniversary, Tessa and Jared! Nine years is sure a lot, so congratulation! Keep that fire burning! <3 My husband and I have only been together 5 years (that's both dating AND married). This Peanut Butter Pie looks like a great treat for a holiday with the family – and we have a lot of nieces and nephews who I think would love this! The make ahead guide link doesn’t appear to be working? Thanks Tess just started to follow your recipes really enjoy how you put it all together thanks! could you please tell me what “Graham crackers” are. I live in the UK and I don’t think they are available here so would have to get something similar. I made pie but had problems making it smooth after adding all ingredients. This was so delicious! I did post on Instagram with your hashtag, if you want to see it! We wanted to make it gluten free. Couldn’t find chocolate gf grahams nearby, so we used regular gf grahams and added a thin layer of chocolate ganache on the crust before adding the filling. We just used the pb cups and chips around the edges and skipped the melted pb and only used the chocolate on top. It was a hit! Will definitely make it again. And again. And again. haha. Thanks for the recipe. Just enter your email below and learn to bake like a PRO!